Driving north along the east coast of Vancouver Island, visitors will pass through enchanting old growth forests, quaint towns and villages and experience breathtaking views of the sea and Gulf Islands. Notable spots include the Lone Tree Hill and Mill Hill Parks, Goldstream Provincial Park and Malahat Drive. While exploring the beauty of this coast, visitors will realize why tourism, along with fishing and forestry has become such an important part of the island's economy. Shawnigan Lake offers visitors a chance for a pleasant side trip to enjoy good swimming, water sports, canoeing and angling opportunities. Visit the Memory Island Provincial Park (boat access only) at the south end of the lake or the West Shawnigan Lake Provincial Park on the northwest side. Continue on to rejoin Highway 1 at Mill Bay. Take a short side trip off Hwy 1 to Cowichan Bay. This sport fishing and forestry village has a relaxed, weathered charm. Located in village centre, the Society offers courses in small boat building and a number of hands-on exhibits. Return to Hwy 1., 54km (33miles) north of Victoria, at Whippletree Junction, a replica of a turn-of-the-century village with a livery stable, fire hall and blacksmith. From the headwaters at Cowichan Lake, the river winds its way through canyons and forests, past the city of Duncan, through a native reserve and into Cowichan Bay. Well known for rainbow and steelhead trout and the salmon runs this river may be easily reached by the Cowichan River Footpath that leads to the most popular fishing spots. This "City of Totems" is home to the Cowichan Native Band, the province's largest. Visitors will find over 40 beautifully carved totems throughout the city. The city is 62 km (38 miles) north of Victoria. The Native Heritage Centre features an impressive display of native arts, books and crafts such as Cowichan hand-knit sweaters, mittens and toques. Also offered are children's programs with beadwork, weaving and knitting. The centre is located at 200 Cowichan Way. Incorporating the two valleys, this unique Ecomuseum has no walls. Residents are involved in showing their heritage, the value and beauty of this region. This area is a nesting and wintering habitat for a number of waterfowl and upland bird species. View from the pullout or take the short trail to this nesting project managed by Ducks Unlimited Canada and owned by Nature Trust of BC. With both indoor and outdoor exhibits, visitors will appreciate the history of B.C. 's forest industry. Displays include a working sawmill and resorted planer mill, a blacksmith's shop and a narrow-gauge steam locomotive which runs through the farm logging camp and forest. Also see log sawing, bucking, shake splitting and paper making. Chemainus: Over 32 murals created by local artists illustrating the history of this area may be viewed around the town. Chemainus is located just off of Hwy 1 on Stuart Channel, 78 km (48 miles) north of Victoria. Ladysmith: First established as a coal mining town, the economy later switched to forestry. In recent years tourism has become increasingly important and many of the town's heritage buildings have been restored. 1st Avenue offers a c\variety of gift shops, galleries antiques and collectibles. Transfer Beach on Ladysmith Harbour offers good swimming, picnicing and a pleasant walk to the heritage harbour site. To visit Roberts Memorial Provincial Park, Quennell Lake, Homer Provincial Park and Brother Twelve take the Cedar Road (south access; 93 km or 58 milesnorth of Victoria) to Cedar and Yellow Points. In the 1920, a middle-aged English sea captain, named Edward Arthur Wilson formed an occult brotherhood and called himself Brother Twelve. From the settlement "Cedar-by-the-Sea", this New-Age prophet took money from this many followers, to keep the Brotherhood operating. The House of Mystery is located on a cliff above the boat ramp on Nelson Road. From here Brother Twelve moved his group to De Courcy Island, accessible by private boat and established his group on the island's south end, now Pirate's Cove Provincial Marine Park. It's rumored that he and his campion disappeared with large sums of money. From here Cedar Road continues and joins Hwy 1. Back on Hwy 1, cross Nanaimo River,a major fishing spot. Just a bit beyond the Nanaimo River Bridge, is the Bungy Zone and Nanaimo Lakes. Those wishing to visit the Nanaimo Lakes must first check with Fletcher Challengs at theis security gate as this is a logging road. Located 110km (68 miles) north of Victoria, this is the island's second largest city. The name 'Namaimo" comes from the Coast Salish Natives also known as Snenymo. First established as a coal mining town in 1852, the city is now the island's largest export centre and major ferry terminal with connections to the mainland. In recent years waterfront walkways, gardens, lawns and beaches have replaced the industrial ports. Built in 1853 as part of the Hudson's Bay Company fort protecting miners brought from the UK to mine coal, the Bastion Museum offers a display of life in the area from 1850-1880. It is located at the corner of Bastion and Front Streets. The Nanaimo Courthouse and The Palace Hotel are just a few of the sites worth visiting. The infocentre at 266 Bryden Street has guidebooks. This federal station was established in 1908 and is now one of the largest fishery research labs in Canada. It is located on Hammond Bay Road. This specially designed bridge over the Nanaimo River was the first Bungy Bridge in North America. Located in the Nanaimo Harbour, Newcastle may be accessed by private boat or a foot-passenger ferry from Swyalena lagoon. It was formerly a coal mining site and CPR Resort. Visitors will enjoy excellent swimming, watersports, hiking and fishing. Trails from the south end of Nanaimo lead to native rock carvings representing birds, humans and animals. Other petroglyphs can be found in the area. Check with the Nanaimo Centennial Museum at 100 Cameron Street. 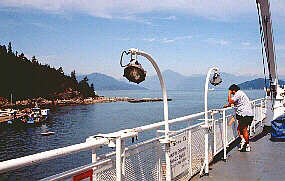 With a pleasant climate year-round, Gabriola Island is a short ferry ride from Nanaimo. Enjoy the abundant shellfish, impressive rock formations and beaches.